Last edited by Barathor; 12-10-2018 at 11:50 AM. I have a silly question! Where do you all put your attack rune? Warbanner or else where? I am one of those who have it on the warbanner (Warmonger Warbanner), which now I use for pvp-offense and m-hunt. There was a time when I would use it too for defense, but having Hera and The Time Keeper made me move again to an "all-green" general defense with Oakforce Warbanner. I would like to take profit of it in every loadout, but the other option is to forge it on a weapon, which works worse for me, as I have different weapons for defense, attack and hunt. I'm in the same boat. I don't see a piece of equipment I can add it to for defense that take Pierce or Resistance away from my loadout. Since maxing out Pierce and Resistance is more important than the minor stats my rune brings, I leave the Attack rune on the shelf when defending, and vice versa when attacking. Putting the attack rune on warbanner is good for both pvp (Attack) and monster hunting! However, when one develops an alliance of all defensive general, one may want to move the attack rune from the red warbanner, the warmonger to the green warbanner, oakforce! If so, no gems could be forged on both warbanner, right? Any better solution for this situation? One can use the red warbanner where atk rune is forged on both atk/def loadouts. You get to keep your rune bonus but you lose physical resistance green warbanner provides. Same dilemma on all runes, u win something, u lose something else. I have attack rune in green banner. Means I benefit of it only in defense, not in attack nor in monster hunting. I have enough attack for monster hunting, and I rather use rune to increase my defense than attack in GBs. I have attack rune on main weapon and always leave it up def/atk. I lose a bit of resist on def loadouts but my legendary gem on weapon helps reduce that enough with bonus to base def. Guardian path resist weapon does not add much resist anyway. This leaves my banners free to use as I want..Pvp/Mon/def. I still use 2 guardian path items in def mode..helm and boots. 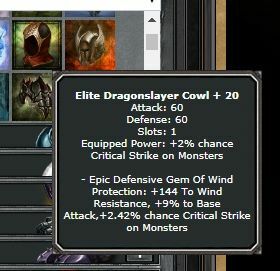 Attack mode only the elite shield from paths. I play all classes so all 20 of my slots are used and could still use a few more. After reading the posts, I have an insight! There are only five types of items could be forged with a rune namely weapon, gloves, armor, helmet and warbanner. Among them, warbanner is the least numerous in term of slot (1 at most) and types (6 only). For other items, they have more types and slots. For example, there are 12 weapons with 2 or more slots. This means if I want to have more forged items with powerful gems and ingots, I should put one rune on the warbanner and then I will have a free choice of one type of items among weapon, gloves, armor or helmet with different utilities. For example, I would have different weapons for different purpose such as PP, PR, base attack, base defense, Agg Gen, Def Gen, Bal Gen, WW, Evade, Crit% etc as well as of course their combinations. As to the warbanner with rune, there is two solutions! One is using one warbanner only. Then forge a powerful gem with it (it should be epic at most except the Legendary warbanner, Arcane Warbanner). Or, you can simply not forge any gem on any warbanner. Giving the priority to flexibility over power. After all, it is one slot only! Until the best of the best gems comes to you OR Until a new warbanner with two or more slots comes ! Any comment ? Last edited by mayi; 12-24-2018 at 04:16 PM.